The Docksider Canoe Dock Rack & Lift acts as both a lift to hoist your canoe out of the water and a rack for storing your canoe on the dock. 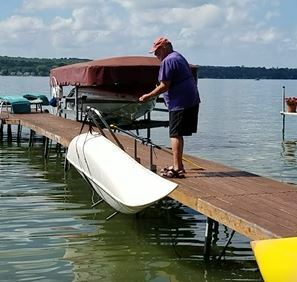 This Canoe Lift and Dock Storage Rack is designed such that you can operate it while you are in the water or on your dock. Board your Canoe from the Water or your Dock! This patented design, coupled with a pulley system (included and used when lifting from the dock) with allow you to launch or store your canoe with approximately 60% of the weight of your canoe. When in the Storage Position, your canoe will sit on its side, vertically.